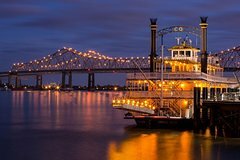 Cruise into a brilliant and romantic sunset aboard the Paddlewheeler Creole Queen! Underneath enchanting skyline views enjoy the lively sounds from Sullivan Dabney, Jr. and the Muzik Jazz band while delighting your taste buds with a deliciously prepared Creole-styled meal. Grab one or two classic New Orleans cocktails inside at the bar, then take a stroll outside along elegantly designed wrought iron trimmed railings for a night full of stars and warm banter. Become part of the city's unique energy and let the sweet Mississippi River breeze sweep you off your senses onto the dance floor atop our promenade deck for a night full of pure New Orleans magic. Once you receive your ticket online please bring your photo ID and e-voucher down to the Ticketbooth located on the Riverwalk Dock (2 Poydras St. New Orleans). When the voucher is successfully redeemed from the reservation agent, you will be directed to board. During the cruise, Jazz will play throughout the night while the sun sets and stars begin to illuminate behind southern clouds. Indulge in a delicious Creole Dinner Buffet in a richly appointed dining room designed with plush Victorian style draperies and soft period lighting. Menu items may include: red beans and rice, jambalaya, Cajun Seafood Pasta, Cajun Braised Beef Brisket, Chicken & Sausage Gumbo, our signature White Chocolate Bread Pudding with Whiskey Sauce, and more! Boarding time for this cruise is 6:30 p.m and and lasts until the boat cruises promptly at 7:00 pm. Cruising duration is 2 hours ending at 9:00 p.m. Cruises are free for children five and younger. Make sure to grab a drink at our bar made of Louisiana cypress and adorned with brass railings for a warm and inviting setting. Then take the stairs to our promenade deck for a night to remember. Let the sweet breeze from the Mighty Mississippi intoxicate your senses while you dance the night away among the stars.